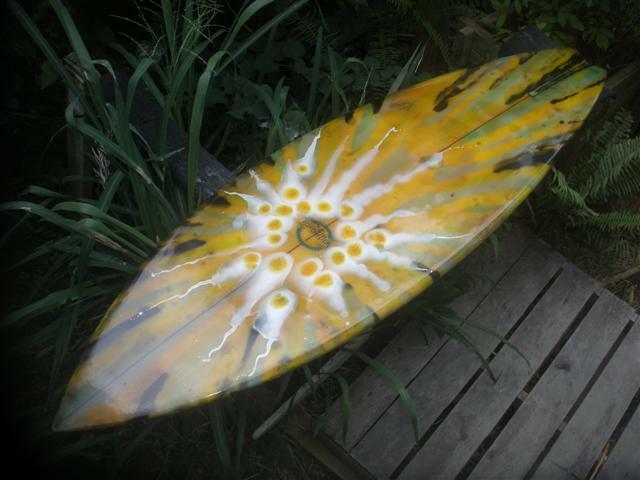 Here’s a follow up on the Sunset board that I am finishing up on today. 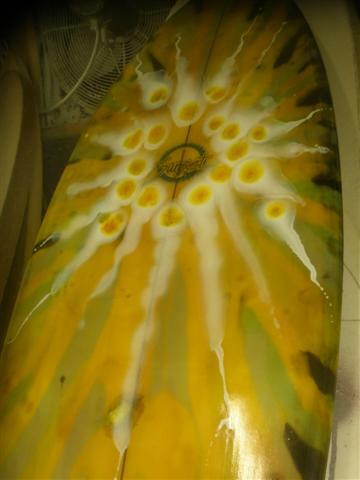 I did an acid splash resin job on the bottom to hide the dings. 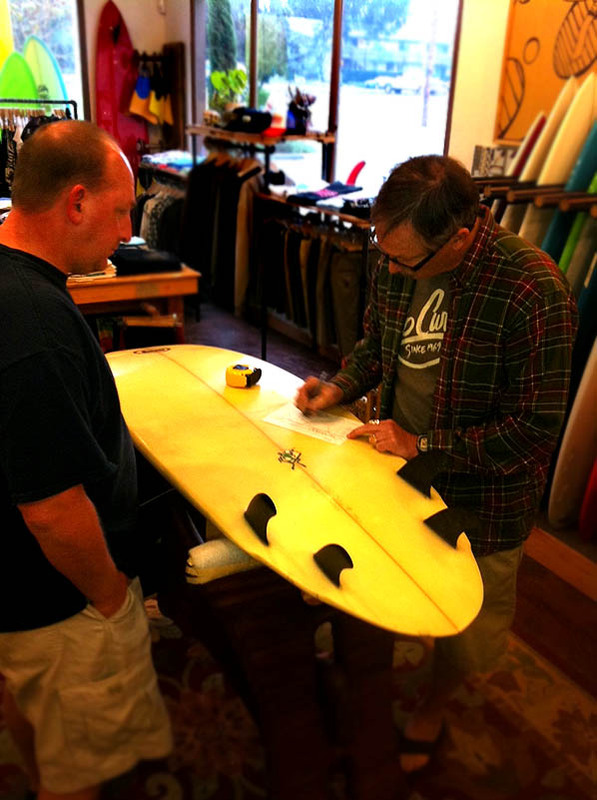 The topside will be painted on the inside of the cutlaps with black chalkboard paint …it is to be used as signage for a shop up at the 4 Seasons here in Kona. 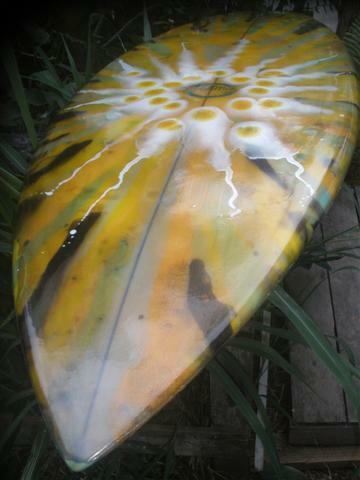 I just thought you guys might dig seeing it…I thought your Dad might like the Sunset splash job. 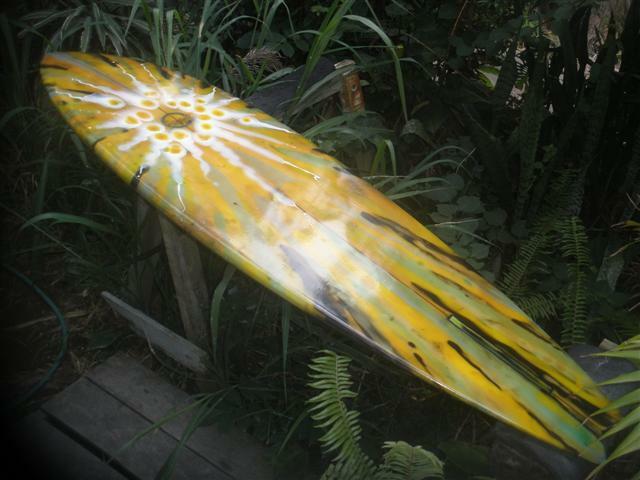 The board was trashed…now it’s functional art. 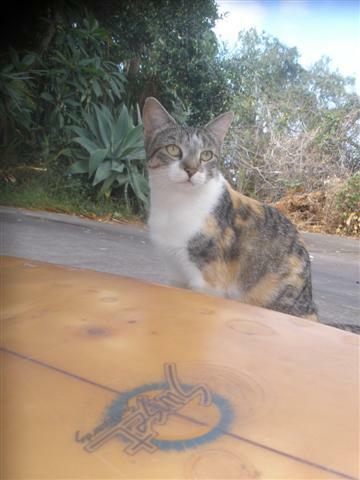 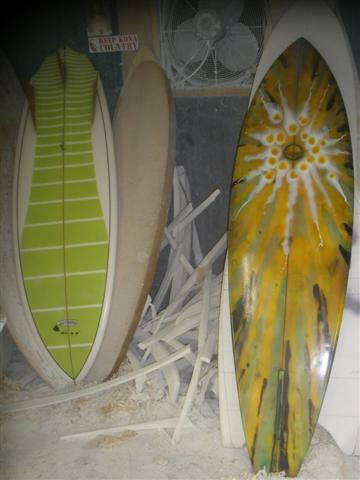 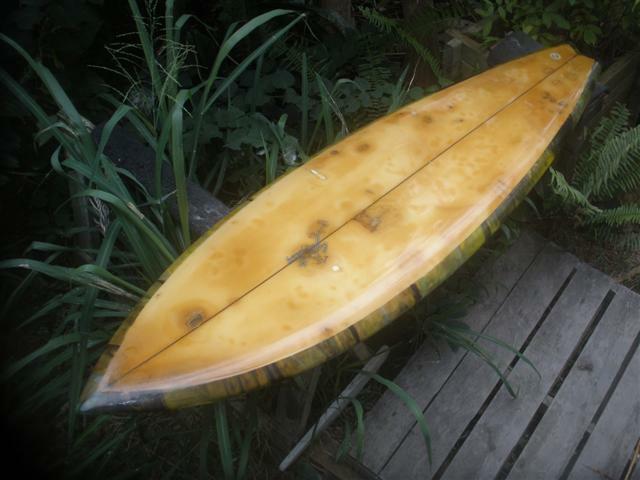 Our friend Erik found Sunset Surfboard #3333 shaped by Ned McMahon at a garage sale. 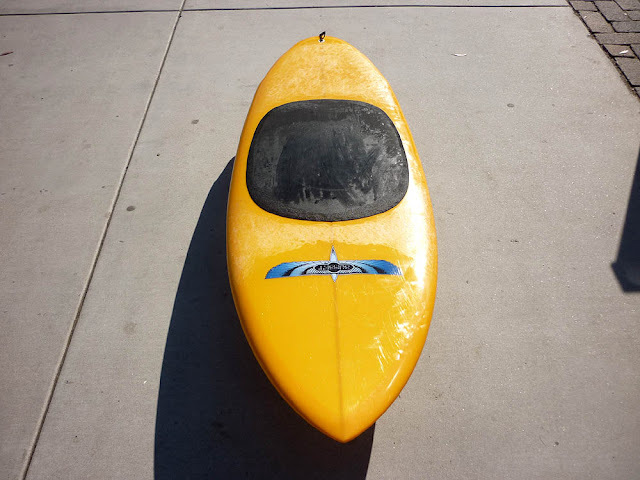 He reports it still rides, yew! 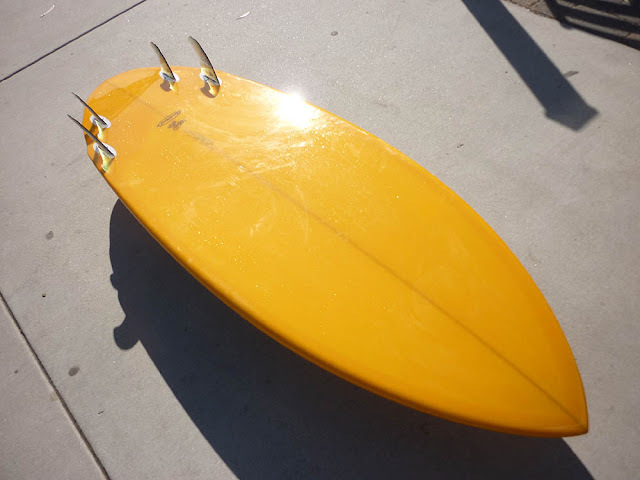 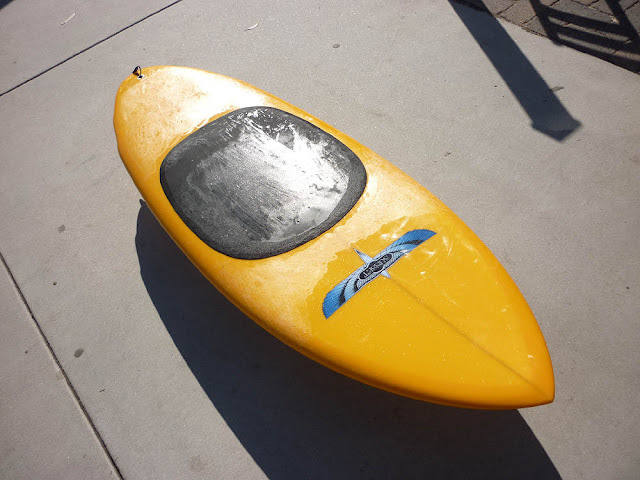 Surfy Surfy reader Joe Scatena sends in these pics of a cool 1970’s Sunset Surfboard shaped by Bill Shrosbree he found at a thrift store in Lemon Grove, California. 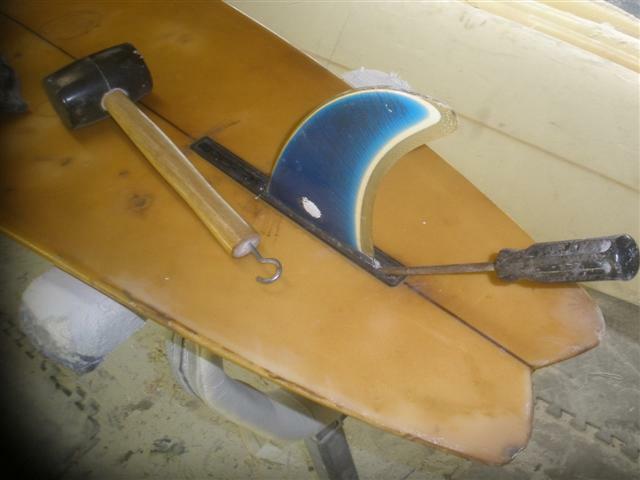 The tail needs a lot of work but it’s got the original fin! 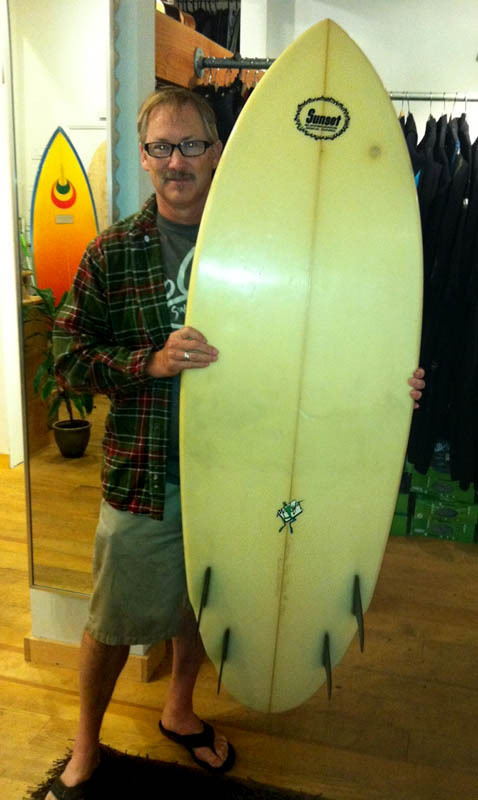 A local guy Brian rescued this 1970’s Sunset Surfboards single fin shaped by Bill Shrosbree. 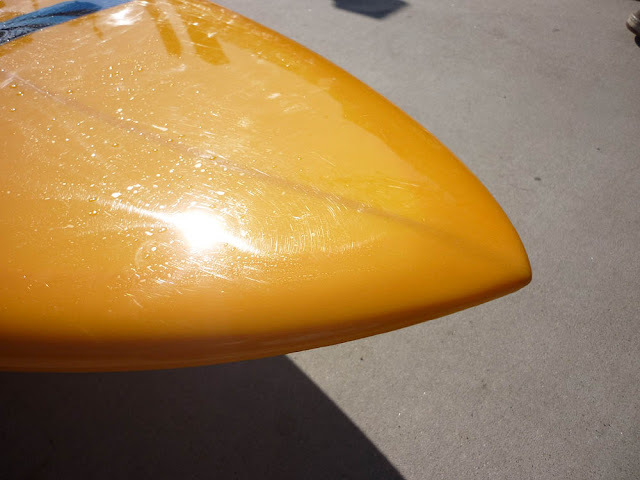 The bottom had a thick coat of blue house paint which still covers the Microgroove bottom. 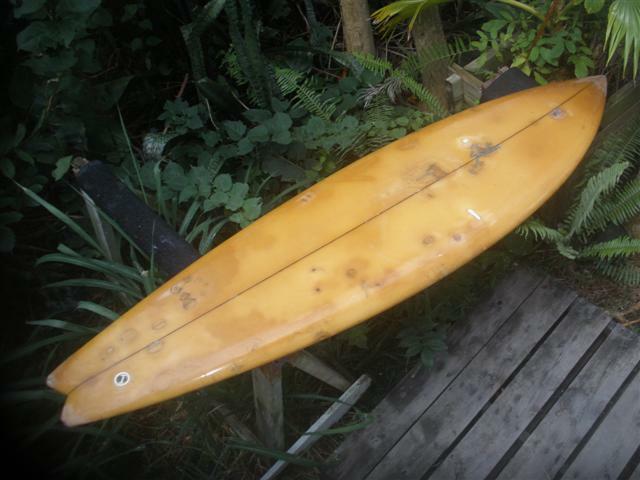 Lots of patina but it rides! 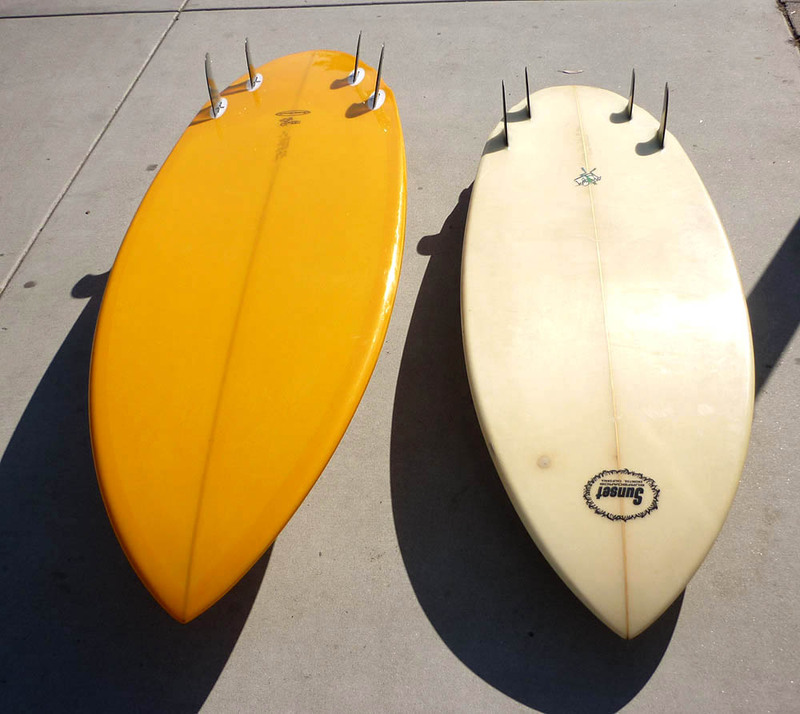 These original Sunset Surfboards are the primordial ooze of which Surfy Surfy was born from. 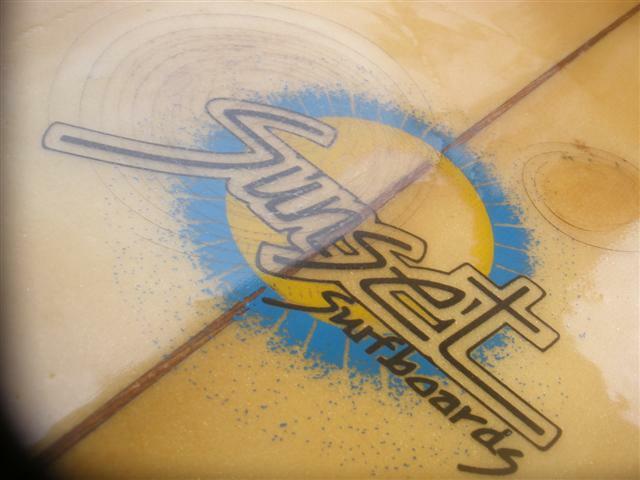 Recently Surfy Surfy acquired a 1980’s Sunset kneeboard from a former Sunset Surfboards shop employee. 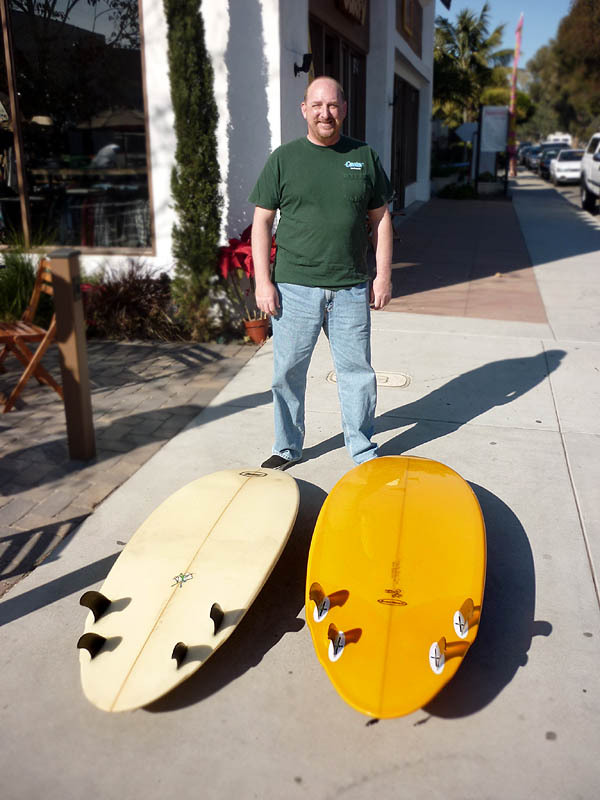 Local rider of alternative surf craft Erik Klimczak liked the original so he asked shaper Brian Fredrickson to shape him an updated version. 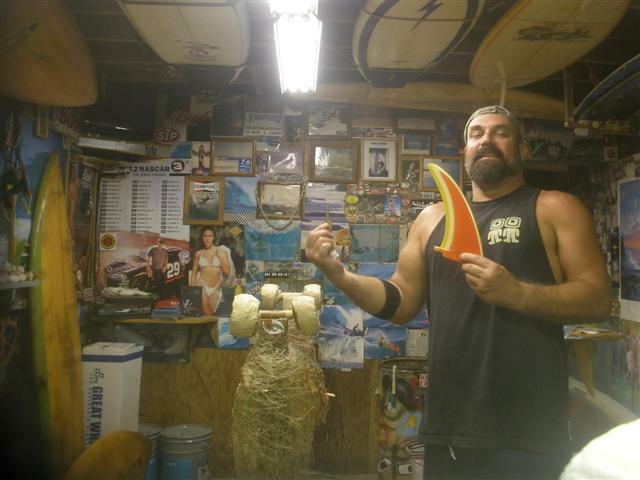 Stephan Jordan scored this 10 year old Sunset Surfboards twin keel Fish for $100 bucks at a garage sale. 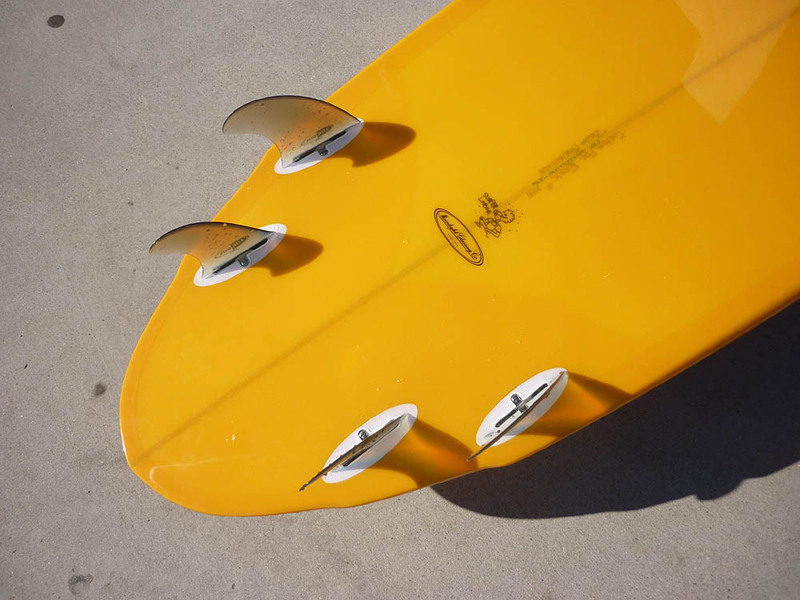 Shaped by Brian Fredrickson. 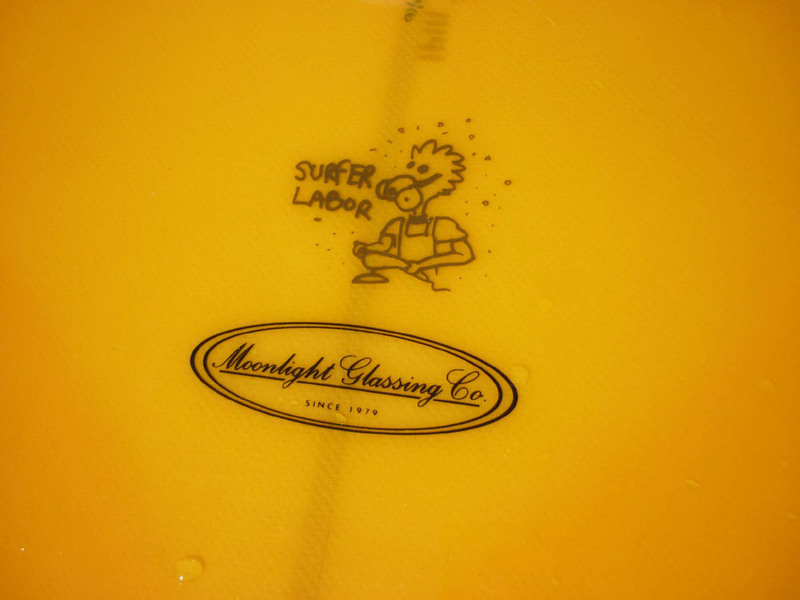 We think it originally belonged to JJR from Lokbox.